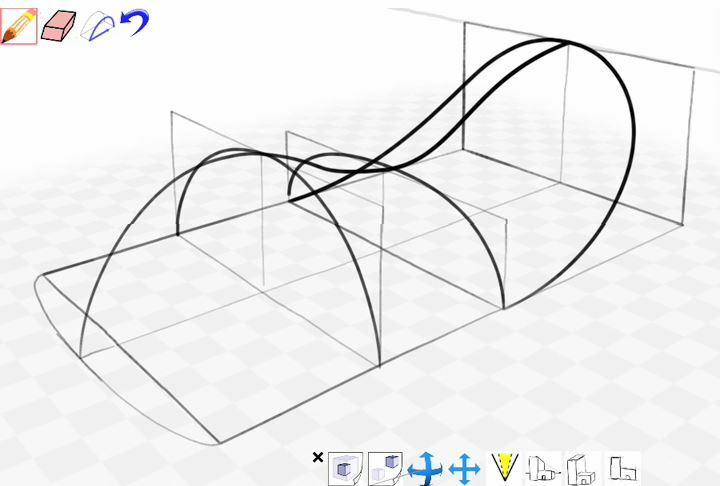 Inferring 3D curves from Perspective Drawings in an Interactive Design Tool. No matter how much we love 3D Modeling, it all starts with a 2D sketch, whether it’s with a pen & pad or using a digital medium. The 3D Sketching tools in CAD are not as intuitive as 2D sketching, far from user friendly, requiring you to design on XYZ axis planes, constraining lines and points (when using Parametric modellers). It takes an advanced user, patience and time to master 3D sketching but when all you want to do is conceptualise your ideas, they get lost by having to concentrate on the software rather than the idea. So most people use the traditional drawing style known as Analytic Drawing; sketching a perspective view on a flat surface, but when the sketch is done and you then need to bring it into CAD, it needs to be redrawn. What if the 2D perspective sketch was being designed in 3D in the background and one could concentrate on the design rather than being held back by the rules of the software? Wouldn’t that be nice. Autodesk Researches Analytic Drawing Project focuses on that goal. It focuses on 2D sketches that infer 3D curves and constraints. It still relies on tangency and constraints but not in the same manner as 3D CAD modellers so it frees up the boundaries, similar to how Sketchbook Designer does for 2D Sketching. It focuses on the concept stage where the only rules that should apply are the ones your imagination brings to reality, not geometrical dimensions and constraints. The examples shown don’t show the workflow from sketch to CAD however, I can only assume that’s the goal and what a nice one it would be. Click Here to go to the Autodesk Research Analytic Drawing Page to view the pdf and video.